1. Coastal cabanas for your outdoor rooms are a great way to keep cool outdoors in the summer. 2. Pool Cabana. When lounging by the pool having a place to get out of the sun is so important. This cabana offers shade over head and side panels if you need more shade. 3. Umbrellas. 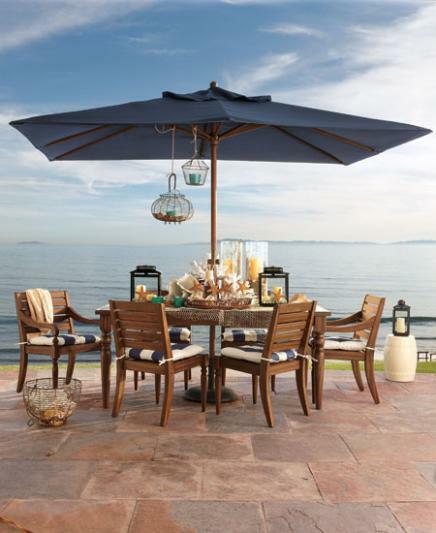 An outdoor umbrella can make those outdoor dining experiences enjoyable in the shade. 4. Sun shade sails. Easy to install for stylish shade spots throughout your outdoor coastal spaces. 5. Fabric roof. Coastal outdoor space with a fabric roof for stylish shade. 6. Greenery shade. Hedges can create green shade for your outdoor coastal spaces. 7. Tree shade. Coastal spaces can be arranged around and under trees for a natural green shade. 8. Pergola. A pergola can create filtered light and shade for your coastal outdoor space. 9. Outdoor curtains. Coastal outdoor spaces can be given stylish shade with outdoor curtains. 10. Retractable awnings. Coastal outdoor spaces can be shaded with retractable awnings that cover a large area.